Readers, I must beg yur pardon. I promised ya’ll back about two Web sites ago that we would be eatin’ a lot of beans. And then I promptly went on to fill these pages with all kinds of non-bean recipes. 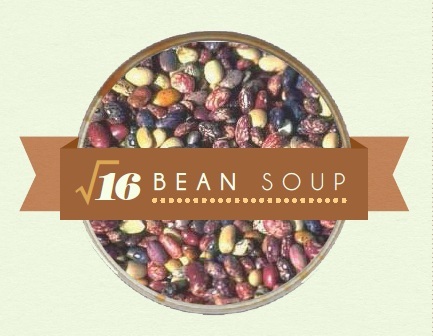 Well, I’m gonna rectify that oversight right now with four delish and nutrish variations to try of 16-bean soup. First you’ll be needin’ a bag of 16-bean soup mix; costs about a dollar in the dried bean section of yur local grocer and it’ll feed ya for at least six meals. (Disclaimer: If you eat more than one sixth of a package of 16-bean soup mix at any one setting, please don’t sit next to me!) Prepare the bean soup accordin’ to package directions. Some of them come with a seasonin’ packet, some say “add yur favorite seasonings.” Now if you happed on the latter, add this to the pot: one tablespoon cumin, three bullion cubes (yur choice, chicken, beef, pork or mixed), 1/2 tsp. of garlic powder and a shot of yur favorite spiciness (black or cayenne pepper, Tabasco, etc.). Once the basic soup is ready to roll, store it in a big, air-tight container and stick in the fridge. It’ll keep about eight days this way. If you don’t think you can stomach bean soup six times in eight days, store half of it in the freezer, where it’ll keep a heck of a lot longer. Each time you dish yurself out a bowl to heat on the stove (or the microwave, if you don’t mind havin’ babies with three ears), add one of these spicer-uppers to create a new tastin’ soup. There’s just a whole lot more you can do with bean soup – I even drain some of the beans and use them in burritos and such – so put yur imagination to work and create yur own set of variables for 16-bean soup! Add to one bowl of prepared 16-bean soup: two tablespoons chopped banana peppers and two tablespoons crumbled feta cheese. Add to one bowl of prepared 16-bean soup: one tablespoon chopped jalapeños and two tablespoons shredded Monterrey Jack or cheddar cheese. Add to one bowl of prepared 16-bean soup: two tablespoons each of chopped black olives and sour cream. Add to one bowl of prepared 16-bean soup: two slices of bacon, cooked well and crumbled, two tablespoons of grated sharp cheddar cheese and sour cream and chives to taste. Well, Girls, He is Lord (of the beans) and God made this food so dern healthy, you ought not to worry about adding a little bacon and cheddar to it. “Diets including beans may reduce the risk of heart disease and certain cancers,” my bean soup package says. Well, I’ll be, beans, beans really are good for yur heart after all. Enjoy!